Automatic Writing MP3 Audio Meditation consists of two tracks, which are provided as two MP3 audio files. In the first track, Kent guides the listener through a balancing exercise. In the second track, Kent guides the listener through a deep meditation to prepare the listener to connect with Spirit using an automatic writing technique. The background music is an original composition created by Kent in his music studio. This is a two-part MP3 set only. 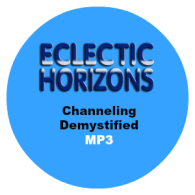 The entire Channeling Demystified Bundle can be purchased here.